We’d love your help. Let us know what’s wrong with this preview of Wendy Woo's Year - A Pocketful of Smiles - 101 ideas for a happy year and a happy you by Wendy Steele. To ask other readers questions about Wendy Woo's Year - A Pocketful of Smiles - 101 ideas for a happy year and a happy you, please sign up. 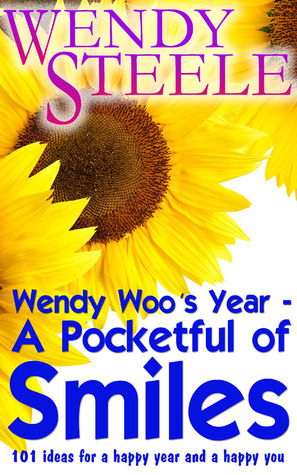 "Wendy Woo's Year - A Pocketful of Smiles - 101 ideas for a happy year and a happy you" by Wendy Steele is golden. Who doesn’t need more reason to smile. This book is an uplift. Something I didn’t even realize I could use. The author has the ability of brightening one’s day and does it in the most glorious way. Even the cover lifts your spirit though this book is much more than a flowery cover. There is a real focus on looking for the good. As I have aged I always seem to question my zest for li "Wendy Woo's Year - A Pocketful of Smiles - 101 ideas for a happy year and a happy you" by Wendy Steele is golden. Who doesn’t need more reason to smile. This book is an uplift. Something I didn’t even realize I could use. The author has the ability of brightening one’s day and does it in the most glorious way. Even the cover lifts your spirit though this book is much more than a flowery cover. There is a real focus on looking for the good. As I have aged I always seem to question my zest for life. It tends to diminish with time but I have learned to keep it going you must go looking for the good and A Pocketful of Smiles is a step in the right direction. This touched me and reminded me to look past the negative because there is good in everything if you look close enough. Through this book I felt the authors passion for a positive outlook and I admired her creativity. I loved the little activities, the photographs and tips for enriching your life. This book is filled with good energy, something we all could use. Highly recommend picking up a copy for yourself. I am so glad I did. This is something I plan to come back to from time to time when I can use a little pick-me-up. "Wendy Woo's Year - A Pocketful of Smiles - 101 ideas for a happy year and a happy you" by Wendy Steele is a refreshing reminder of all the little things we can do ourselves to make our life a little more pleasurable. In 101 small snippets, assigned to the appropriate calendar months, Steele recommends her own remedies, food, recipes and activities. They are not cooked up in a laboratory or newly invented - quite the opposite. They are taken from life as we must not forget it, in sync with natur "Wendy Woo's Year - A Pocketful of Smiles - 101 ideas for a happy year and a happy you" by Wendy Steele is a refreshing reminder of all the little things we can do ourselves to make our life a little more pleasurable. In 101 small snippets, assigned to the appropriate calendar months, Steele recommends her own remedies, food, recipes and activities. They are not cooked up in a laboratory or newly invented - quite the opposite. They are taken from life as we must not forget it, in sync with nature, animals and plants, the seasons and our selves. I must congratulate the author for compiling a selection of common sense advice. While I was reading paragraph for paragraph I nodded many times, knowing well that I should not be sitting next to my computer reading on the kindle but instead sit next to plants and stroke my dog, to give just one example out of the many suggestions the author made. Having read through the book once in one sitting I wish I had a calendar with all of these so I could remind myself more easily on a daily basis of Steele's great ideas. This is an amazing book. Filled with tips, activities and recipes of living a more fulfilled life. Most of these are nothing but common sense but somehow the happy and cheery way it is presented brought a smile to my face while I was registering the sense of the words logically and processed the good nature and love of life this author feels toward all in my heart. Truly an amazing short read. Dont even bother to delete it from your Kindle. Youll reread it soon. Wendy Woo's Year- A Pocket full of Smiles was a sweet surprise. Charming and chock full of advice, suggestions, even recipes, the book takes you from January to December offering up ways to enhance everyday living. From simple gestures like petting your kitty, to a lesson on the benefits of using lavender oil, this book is brimming with lovely ideas for "choosing to be happy". Light and easy to read, but full of food for the soul. I am looking forward to reading more of Wendy Steele's books. I was enticed by the title and the bright sunny flowers on the cover. We all need a smile sometimes and when life gets busy and we get wrapped up in tasks and routines, we often forget to smile. This lovely little book reminds us of things in life that we can take joy from and sometimes, return joy. If you need a reminder, like so many of us do, to smile... then I'd recommend this to you. Wendy Steele is one of those authors who can bring a smile to your face. Her writing, especially in this book, is inherently positive and designed to lift your spirits. This book is designed to get you thinking differently and give you something positive to do every day of the year. A great addition to the collection of anyone who wants a more positive outlook on life. A lovely light hearted read.